By Sue Chan - New Zealand - 20 Jun/03 - Viewed 1927 times. On the 3rd of February 1931 at 10.46am an earthquake, 7.8 on the Richter scale, hit Napier and the surrounding areas. The epicentre was 15kms north of the town. 258 people lost their lives and most of the buildings in the town centre were destroyed either by the quake or the fires that followed. The few that survived were either of wooden construction or the most recently built concrete buildings, which had been reinforced with steel. The entire Hawke�s Bay area had to be resurveyed because of the movement of the land and this began immediately. By May 1932 nineteen new shops were ready and one month later 129 were completed. 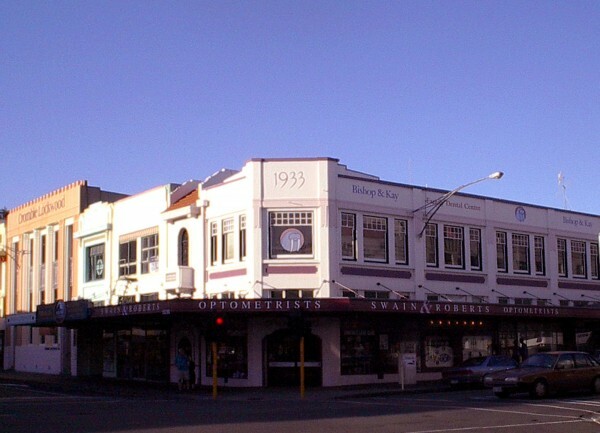 The Art Deco style was fashionable at the time and it suited the need in Napier for a safe form of construction to protect the town from future earthquakes. It was also a cheap building method being basically a concrete box. Many of the building owners received nothing from their insurance companies, which deemed the quake to be an act of God, not covered by their policies. The new buildings were all constructed of reinforced concrete, the material that had proved itself in the quake. In January 1933 the almost completed reconstruction was celebrated by the New Napier Carnival. Now each year in February the Art Deco Trust stages a festival. The entire area was tilted upward by up to 2.1 metres causing the water in the Inner Harbour, 300hectares of shallow lagoon, to drain out to sea and by the next day most of the water had gone. The Harbour Board began a drainage scheme and by the mid 1930s some areas were producing crops and although salinity is still a problem in some parts, the old sea floor is now a richly productive area. The Airport is situated where yachts once sailed and suburbs now stand on the former swampy southern reaches of the lagoon, which became totally high and dry. The total area raised was 40 sq. kms. We arrived in Napier by 5pm and after settling into our room at the Tennyson Motor Inn, set out to see the architecture then followed the main street through to the beach. The buildings were fascinating but the beach left a lot to be desired! Instead of sand it is made up of grey shingles which over millions of years have been washed down from the mountains, worn smooth and piled up by the surf. We found it very difficult to walk on, and it drops steeply into the sea, which would make it suitable only for very strong swimmers. We were out about two hours and very impressed, wishing we could spend more days there. Next morning before leaving we drove to the Bluff lookout, which had views across the town and the harbour and, after a quick visit to the information centre, left at 9.30. On the cover of the telephone book in our room was a view from a lookout I could find no reference to in any of the brochures. We found it at Havelock North in Te Mata Peak Reserve. It was the most amazing lookout, almost 400 metres high and reached by a very long, narrow, winding road. We spent half an hour there admiring the 360o views. Napier is the main port and administrative base of the Hawke�s Bay region and Hastings, only 20kms away, is the service centre for the market gardens, orchards and farms of the hill country. Hastings we found to be a lovely small city with Art Deco similar to Napier � this town too had been partially destroyed by the earthquake. The clock tower in the paved Civic Square was built in 1934 to house the bells from the old 1909 Post Office Tower, which had collapsed during the quake, throwing the bells across the intersection. After an early lunch we headed for Wellington through the Hawke�s Bay Wine Country a five-hour drive. We stopped for smoko in the park of the Heritage Museum at Waipawa, a small town servicing the surrounding sheep farms, then passed through Dannevirke, originally a bush settlement established by Scandinavian migrants in the 1870s. Following the SH2 we passed through many small towns in areas once known as Forty Mile Bush and Seventy Mile Bush. A lot of timber must have been taken from here over the years, as there is not much bush now. It had been quite windy for some time and at Woodville we saw, along the top of the hills, a row of wind power generators. Also in this area we saw paddocks of Belladonna Lilys, one of my favourite flowers, which unfortunately we were not able to stop and photo. I have never before seen as many in one place. At Eketahuna we took a photo of a Kiwi statue and at Masterton we called into McDonalds for an apple pie and a drink to get us ready for the drive into Wellington. Soon after we came to a range of very high hills with 15-20km of narrow winding road. The scenery was very good, but it was hard driving towards the end of a long day. Following the motorway we passed the exits to Upper and Lower Hutt making us think we were almost there but Wellington was still quite a bit further on. We came to the exit for Thornton, which Ron recognised as the suburb where our accommodation was, and following this drove directly to the Portland Hotel, which we thought was quite clever through one-way streets without a map. It was 5pm when we parked the car in the Hotel car park at the back and took the lift to our room on the 4th floor. No great views here but we could see across the city a bit. We did not move the car until we were to leave two days later as the Hotel was almost in the centre of the city. That evening we walked from 6.30 � 8.15 getting our bearings ready for sightseeing the following day. Known as �Windy Wellington� (not when we were there) the New Zealand Company chose the area for its first settlement in 1840. When a more central location was sought for the capital in 1865 Wellington was chosen and the government and diplomats shifted from Auckland. It now has a population of around 166,700. Next morning our route to the city took us past the new St Paul�s Cathedral opened in May 1964, where we stopped and had an informative conversation with the guide. The Government Buildings are in the next block. Here in the same grounds are the Parliamentary Library, Parliament Buildings, built in 1922 from marble and granite, and The Beehive opened in 1986, which houses the Executive Offices. I�m not sure if it has been called this because of it�s distinctive shape or because the office workers work away like bees! In Cable Car Lane is Lambton Station where we boarded the Kelburn Cable Car for a trip up to the Botanic Gardens. This climbs 130m past the University up a 1-in-5 gradient and through a series of tunnels to the Gardens. The original wooden cars were built in 1902 and were replaced in 1979 when the line was upgraded. At the top is a Cable Car Museum where 100 years of operation, (on 22 Feb.) were being commemorated. Here we went down into the winding room and watched a video of the early days. Established in 1868 the Botanic Gardens cover 25ha and we followed many paths, past the observatory, the duck ponds, succulents and seasonal displays. We came to the Founders entrance then re-entered at Centennial Entrance to visit the Lady Norwood Rose Garden where the central fountain is over 100 years old and was originally outside a London bank. After visiting the Begonia House we continued through Bolton Street Memorial Park. The land for this historic cemetery was set out on the N.Z.Company�s plan of 1840. It served the town until 1892 when it was closed except for new burials on existing plots. In 1967 it was closed to all burials to allow the construction of the urban motorway. About 1.5 hectares of the cemetery were taken for the motorway, causing 3693 disinterments. The memorials were reinstated on land elsewhere in the cemetery. It was a very interesting walk through many historic features, including the Seddon Memorial erected in memory of New Zealand�s longest serving Prime Minister, over the motorway and arriving back in the city a short distance from our Hotel. On the way we bought a sandwich and took it back to our room for lunch. We had walked almost 5km so rested for an hour or so before setting out again to explore the wharf area. We passed Old St Paul�s Church and took photos of several other historic buildings. The old Harbour Board Building is now home to the Museum of Wellington but we decided we did not have time to see it properly and continued around Lambton Harbour to the new Museum of New Zealand Te Papa Tongarewa. One of the largest museums in the world this complex covers an area the size of three football fields and is similar to the Australian Museum in Canberra (except it is New Zealand!) It would take several visits to see it all and we were very impressed. It was hard to find your way around but we saw the realistic display of volcanic power and natural history exhibits including information on the Royal Albatross and the Moa, which has been extinct for 500 years. There was also a canoe hall with a carved Maori canoe and meetinghouse and �Golden Days�, a very original attraction where 100 years of New Zealand�s history comes alive in just 12 minutes � all inside a junk shop! We stayed at the Museum about two hours but could have spent much longer. We retraced our steps to Civic Square where a colonnade of Nikau Palms, sculptured in metal make an unusual sight. Here the Bounce! 2003 Festival was being prepared with balloons and balls ready for weekend festivities. The historic Old Bank Building sits on reclaimed land nearby and had been allowed to become almost derelict before a contract was let to Ipoh Limited � the company that restored the Queen Victoria Building in Sydney � for its restoration. It now seems very similar to the Q.V.B. with original mosaic tiles, timber shop facades and a clock, constructed in 1998, with petals which open every hour to reveal four 3-Dimensional animated scenes depicting the history of the Arcade site accompanied by narration and music. On the way back we went to a very large New World Grocery Shop only one block from the Hotel. This was the only grocery shop we saw in the city. No doubt there are plenty in the suburbs. Next morning we checked out at 9.30 and, after receiving instructions on the route to the ferry, went for another walk as our ferry booking was for 2pm.We went back to Old St Paul�s as the day before it was in use and we could not go in. This Church was consecrated in 1866 the year after Wellington became the capital of New Zealand. When the new, larger cathedral was begun in 1954 it was decided to demolish the old building but there was much opposition to this plan and it was offered to the government. New Zealand Historic Places Trust now manages it. The building is made of native timbers the building material that had been found to withstand earthquakes and is known for its architectural style. The original organ, installed in 1877, was moved to the new cathedral and one was specially made for the old church and installed in 1977. The original bells installed in 1867 were also moved to the new cathedral and the present peal of five bells was installed in 1979. We walked back past the railway station to the quay to be sure we had the route to the ferry correct as there was only one small sign which we had noticed the day before, and then back past the Government Buildings to the Hotel.